PIR will work with all eligible PIR participants throughout the NDIS application process, as deemed appropriate by the participant. To check if your client may be eligible for the NDIS, click here to access the NDIS Access Checklist. For more information on eligibility access requirements, click here. How can you assist your client requesting an NDIS package? 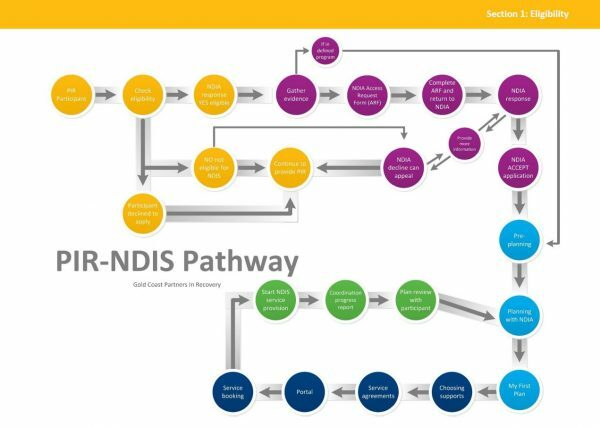 If you would like to find out more about how you can assist you client to access the NDIS, call PIR for a chat on 1300 130 339 or request an information session with one of our team. What are the steps for accessing and obtaining an NDIS package for my client? Below is a diagram of the steps involved in the process for applying for the NDIS. If you have any questions, feel free to send us an enquiry here, or you can search the NDIS website. For more information on Service Providers and the NDIS, please see the helpful links box on the left.